The idea behind an “in-book app purchase” is that the non-fiction e-books of the very near future will include handy links to outside websites where readers can buy supplementary content in the form of tools, tutorials, or useful apps for their phones. For example, an e-book about personal finance might allow readers to buy a convenient self-employment tax calculator for $1.99 just by clicking on the page. An e-textbook for Biology 101 might give confused students the option of downloading a supplementary tutorial about mitosis for $2.99. 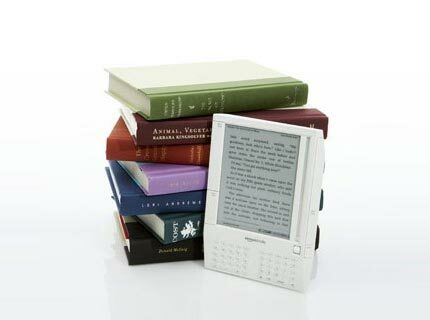 As e-reader technology develops, publishers and authors are going to find more and more inventive ways of making their e-books competitive. For example, a cookbook might dangle the prospect of a recipe-specific grocery list-generating app before interested readers. A personal finance e-book will be able to help you with your taxes in real-time, providing specific numbers instead of generalized tips. An e-textbook will offer a dizzying array of optional tools and tutorials to help you learn anatomy, master the color wheel, or solve for x. As the public comes to expect more and more free or cheap content, e-book authors might find that they make most of their revenue through in-book purchases rather than book sales. Authors and publishers will continue to find inventive ways of monetizing e-books—for example, by turning the bibliography section of their e-book into an Amazon Associates store, or by offering discount coupons for conferences or webinars associated with the book. In the very near future, we’ll probably see some spectacularly awful examples of attempts at in-book app marketing, and hopefully a few graceful ones to balance things out. Like many people, I would feel positively turned off by a book that tried to sell me another gadget on every other page—but if I was desperately trying to figure out my self-employment tax, I might be grateful for a book that offered me an easy solution for a couple dollars. In order to be minimally irksome, authors and publishers who want to make in-book app sales will need to make sure the apps they offer are truly relevant, truly useful, and minimally distracting to the reading experience. If you’re planning to publish an e-book in 2011, it might be time to start thinking outside the text. Book-related apps and tutorials may not be the standard now, but they might be in a few weeks. Stay tuned!